Summer officially ends tomorrow. It’s still pretty warm at my house, and my garden is still going crazy. Tomatoes out my ears. In a good way. However, I was looking for a dinner that had tomatoes, but didn’t scream “trying to get rid of a counter full of tomatoes”. Enter this pasta dish. It was perfect for a warm late summer/early fall evening with lots of bright flavors. Enjoy! 1. In a large pot of boiling water, cook pasta according to package directions, without oil or salt. Add broccoli for last 3 minutes of cooking. Drain well. 2. Meanwhile, heat butter and oil in a large skillet over medium-high heat. Add pork, garlic, italian seasoning, and lemon zest. Cook 7-10 minutes, or until pork is cooked through. Deglaze pan with lemon juice. 3. Add pork mixture to pasta and broccoli. Toss with parmesan and tomatoes. Recipe notes: If you can’t find a vegetable spaghetti, you could use all whole wheat. 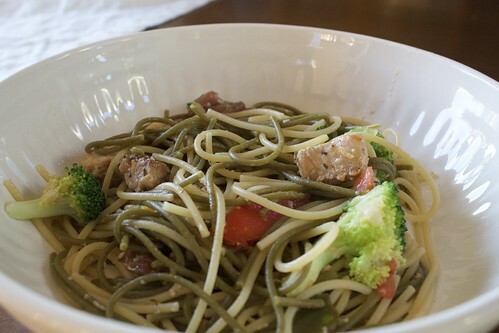 My mom made a similar dish to this growing up and always used spinach linguine.